You can apply Plexus to a solid in a composition in After Effects. Make sure the solid is NOT 3D and is of the same size of the composition. Although Plexus works with Non-Square Pixel Aspect Ratios it is always recommended to use Square Pixel Aspect Ratios to create motion graphics. To Apply Plexus, select the layer and Go to Effects and go to Rowbyte category and apply Plexus. When you apply Plexus, you’ll see a new floating window popup on the screen. It is the Plexus Object Panel, which is a dockable Window in After Effects and you can dock it anywhere you like in the AE interface or leave it as a floating window. 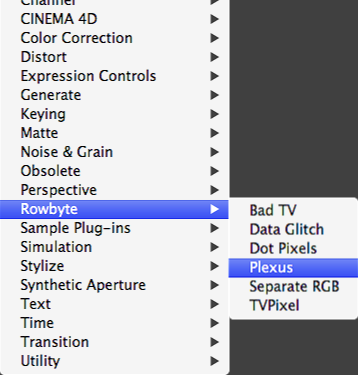 The top of the panel is called “Plexus Toolkit”, a set of buttons that helps you add more objects to the effect stack. When you apply Plexus two effects are automatically added to the Effect Controls Window. The “Plexus Points Renderer” which creates points from the vertices added by the geometry objects and “Plexus” which is the main renderer that renders everything. A simple tree like interface helps you select any Plexus Object you choose in the current layer and the corresponding Effect is shown in the Effect Controls Window. You can also create Groups and put multiple objects in them. 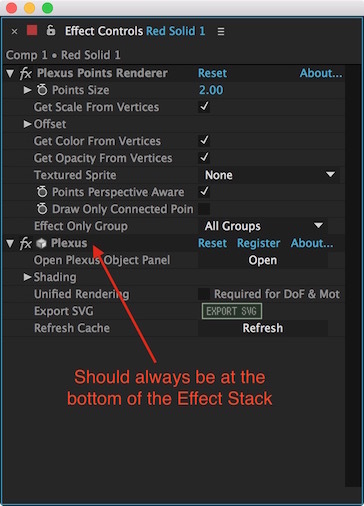 Always make sure to keep the effect “Plexus” at the bottom of the effect stack. Otherwise, you don’t see anything being rendered in the composition window. Geometry Objects: These objects help you create or import geometry into Plexus. They add new vertices and/or facets, which cannot be rendered until you add a ‘Render Object’. Effector Objects: These objects help you modify various properties of the vertices & faces like color, position, scale etc., Order of these objects in the effect stack is important because, they are applied in that order. Render Objects: These objects are needed to render the vertices or faces or any types of interactions between them. You can have multiple render objects and like effectors, order of these objects in the effect stack is also important, since they are rendered in that order. Click through the links of the objects to know more about how they work and what they do.